Place grated cucumber on paper towel. Sprinkle lightly with salt and let drain for about 15 minutes. 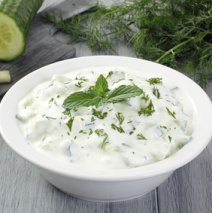 In a large bowl, combine Sunrise Farms Plain Yogurt, dill, garlic, olive oil, sugar and lemon juice. Stir in the cucumber and let chill for about two hours.